The Gryllacrididae, or raspy crickets, are a family of non-jumping crickets in the suborder Ensifera or long-horned grasshoppers. There are two subfamilies — Gryllacridinae with over 600 species in over 90 genera; and Lezininae with a single genus and 12 described species. Only Gryllacridinae occurs in Australia. Gryllacrididae sp. nov. (Gryllacrididae). 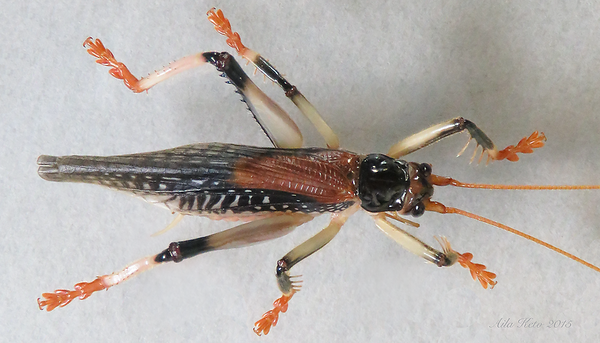 We found this in January 2015 from the ARCS Ankida property and failing to identify it called it the "Pink-bootied Cricket". We are grateful to Dr David Rentz for identifying this as a new species within an as yet undescribed genus. There have only been two previously discovered species found only in North Queensland.